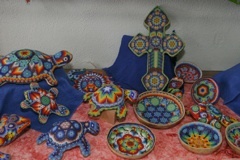 After 12 years of selling their pottery at shows all over the country, Jan and Jon Brieger opened Brieger Pottery on the Blanco Town Square in June 1992. Located in the front section of a stone and brick building constructed in the late 1800’s, the shop was originally 300 square feet devoted exclusively to their pottery and open Saturday and Sunday only. Several expansions and 16 years later the store now encompasses 2000 square feet, featuring the Briegers’ high-fired, functional stoneware pottery. Made with native Texas clay and soda-fired, it is microwave, dishwasher and oven safe, and also lead-free. 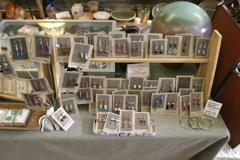 Also showcased are the work of over 20 other artists and craftsmen, and a wonderful selection of quality products, including other pottery, jewelry, wind chimes, soaps, cards, etc. 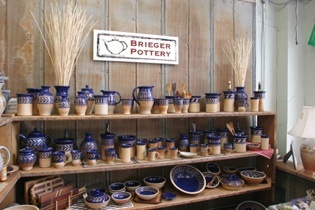 Brieger Pottery is open 7 days a week and also serves as the year round location for Hill Country Lavender, the first commercial lavender farm in Texas. 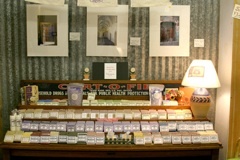 Established in 1999 by Robb Kendrick (a National Geographic photographer) and Jeannie Ralston (a freelance writer), Hill Country Lavender is now owned by Jan and Jon’s daughter, Tasha Brieger, and its complete line of more than 70 products fills the store with the relaxing scent of lavender. We carry a selection of items from Mexico, many from artisans we personally know, including Huichol beadwork, scarves, jewelry, handmade books, etc. 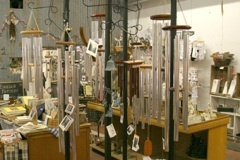 For a sample of our featured artists and products ; click links on top of the page.